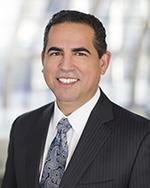 Luther Villagomez, general manager of the George R. Brown Convention Center, has been associated with the facility since 1985. He has directed day-to-day operations at Houston's premier meeting place since 1990, was promoted to assistant director in 2000 and assumed his present title of deputy director/general manager in 2003. Villagomez has been involved in many major events at the George R. Brown, beginning with its construction in the mid-1980s and its official opening in 1987. He has seen many shows, such as the International Quilt Show and the Society of Exploration Geophysicists, grow along with the facility. The George R. Brown hosts more than 40 major conventions and more than 200 other events annually. Among the high points during Villagomez’s tenure include the completion of a $165 million expansion project to virtually double the size of the convention center in 2003, hosting fan festivals associated with the 2004 Super Bowl, 2004 Major League Baseball All-Star Game, 2006 NBA All-Star Game and successfully converting the convention center into a humanitarian shelter after Hurricane Katrina in 2005. His career with the city began as an event manager at Albert Thomas Convention Center, Jones Hall, Music Hall and Sam Houston Coliseum. Villagomez and his wife, Karen, have three children.